Data Environments, Inc. supports owners and agencies by managing IT projects and the commissioning process in three distinct areas – design management, project management, and turn over. Design Management includes a review of the project design to document and give feedback on reliability and adherence to standards. As a commissioning agent, we are called on to provide experience to owners and agencies regarding Best Known Methods, to achieve redundant designs for high efficiency and reliability systems. Project Management, when executed by a commissioning agent, includes a discipline of careful planning, organizing, and controlling resources for construction installation, and identification of differences from design specifications. 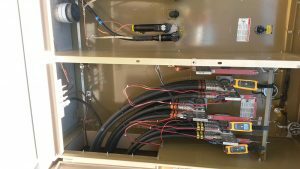 Data Environments inspects the facility, provides pre-functional check sheets to contractors, creates testing scripts, and executes on-site facility testing to determine the ability to carry electrical and mechanical infrastructure loads as designed by the engineers. An effective Turn Over closes out the project via the commissioning report. During turn over, Data Environments, Inc. works closely with the owner or agency, and the construction and operations teams, for final approval of the project. As a commissioning agent, Data Environments supports owners and agencies by effectively managing human, financial, and technological resources for on-time, on-budget delivery of high quality installations.